Kids love Larabee. Probably because Larabee himself is a big kid at heart. He’s the mad scientist who would be a superhero’s sidekick after all. Still, watching him as he entertained April’s classroom, it made me a bit sad to think that Larabee didn’t have any kids of his own. I gave brief thought to trying to find Larabee a girlfriend, but that was something that even a real superhero could do—or at least, I thought maybe April would be better at doing that. Maybe one of the teachers here would appreciate a man with a few delusions and a tendency to forget pants? No, they were teachers. They were smarter than that, right? “There. Now everyone has their costume, right?” Larabee asked, looking around the room. He looked to April, and she nodded. There were still a couple of the kids behind the curtain changing into their costumes, but he’d gotten one to each of the kids who had come to class today. And, of course, he was wearing one of his own costumes. He’d come as Magenta Man, and he’d tried to talk Clayton and April into costumes, but they’d refused. 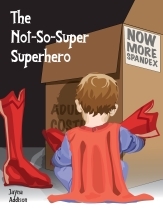 April had claimed that she needed to be appropriate for the students and any other teachers that might come by—having a superhero party was kind of rare and special and the others were curious—so she was not dressing in anything. Clayton had simply reminded Larabee that if he ever wore spandex, he would kill himself. So the kids got their spandex, running around madly and calling each other by superhero names. “Larabee, I thought we agreed that you weren’t going to model any of the costumes,” Clayton began, and April elbowed him. He shrugged. He couldn’t believe she was willing to watch that again or let the kids in her class see it. Those poor children, scarred for life. Larabee gave him another look, and April elbowed him again. He winced, and the kids giggled. They really did like Larabee, more so than their so-called hero that April insisted that he was. He had to wonder if she’d put them up to the drawings. *To see the flame dress, go here.